We offer an exclusive range of Embroidered Cotton Bags that are a perfect blend of value and utility. 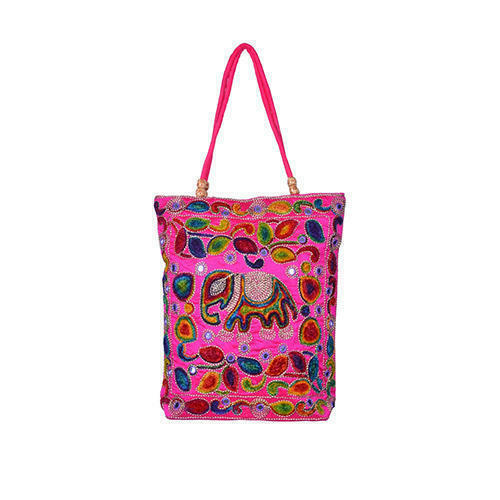 These bags are known for their beautiful patterns, unique designs and longer service life & very ideal product. These embroidered cotton bags are made of optimum quality cotton fabric and are available in varied beautiful embroideries, colors and sizes to fulfill the requirements of our clients. Clients can avail these bags at market leading prices and in customized specifications. Think Fashion, Delhi established in the year 2007. We are engaged in manufacturing and exporting various products like Leather Bags, Embroidered Bags, Fashion Bags, Hand Bags, Beaded Purses, and Leather Wallets, Leather Belts, Leather and Tweed Jackets, Coat, waist coat, Cape and skirts etc. These products are designed with latest trend in the market and have exclusive features like elegant design, dazzling look, intricate sizes and light weight. These products are available in different shapes and sizes and can be customized as per the specifications provided by our customers. We are having skilled fashion designer who designs each product with extra effort and widely appreciated by our clients. These products are made in such a way that it can be worn at parties, marriages and as well as for everyday purposes. Under the guidance of our CEO, Mr. Om Parkash, is having vast knowledge and experience who helped us to achieve success in the market. We are very well equipped to deal in export market and looking for international buyers world wide. J-2812, 1st Floor, D. S. I. D. C.